1. 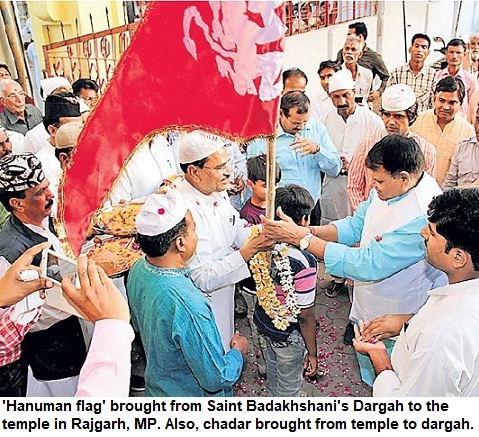 The son of Haryana's seasoned politician Bhajan Lal decided to convert to Islam. The conversion was apparently not because of his strong faith but for getting married for the second time. So Chander Mohan became Chand Mohammed and his lady love, lawyer & former Asstt Advocate General, Anuradha Bali appeared as Fiza. It has all the making of a Bollywood potboiler and even goes beyond. Chander Mohan was mysteriously missing for a month and suddenly appeared on TV screen. Ensconced on the rear seat of a car with a lady wearing goggles, the Haryana Deputy Chief Minister said that he was 'studying Islam' and had faith in the religion. In the same breath when asked about future, he said 'sab bhagwan ke haath mein hai'. He realised it and later used the word 'Allah'. He kept mentioning how much he loved the lady and was ready to forsake anything for her. No wonder, Muslims and Hindus are equally against it. Ulema have condemned it. The influential Ludhiana Jama Masjid's Shahi Imam Habibur Rahman Sani Ludhianvi has issued a fatwa against him and termed the wedlock as 'fraud'. He has asked for arrest of the politician. In the past there have been several occasions when politicians and celebrities married twice or even thrice. Union Minister Ram Vilas Paswan illegally keeps two wives. Many others simply marry at a temple and don't bothe about consequences or legalising the matrimony at any cost. The marriage may be unethical but who cares about ethics. Had he not married and just kept Anuradha Bali alias Fiza around and been moving with her, he wouldn't have faced any problem. A case in point is the episode involving Amrinder Singh, the former Punjab CM, who kept the Pakistani lady journo with him but there was no major issue about it. 4. However, it was perhaps the conversion (to Islam, more shocking) and a bit of drama in this episode which led to the sacking. Chander Mohan, at least, deserves praise on one count. He risked his job and also lost the post. These days nobody wants to lose the chair, even if it is a corporator's post, let alone Deputy CM. Chandra Mohan's father, the veteran Bhajan Lal, has disowned his son and the political career of the man seems in jeopardy. 5. Ishq. He said he had enough of money and other things. And was now concerned about other things like love that would give him satisfaction. The happiness index does differ from person to person. Seasoned politicians hardly care about 'promises' and keep having flings. He, at least, married and paid a price. That's the only silverlining out of the episode. Of course, TV channels got interesting drama to run for a couple of days.